If Gameloft ever wants to shed its reputation as a studio that copies other people's ideas and repackages them, then they probably shouldn't be releasing games like Shark Dash. Not that it's a bad game. It's decent! But it's as shameless a ripoff of Angry Birds as you could hope for, copying most of that game's key foundations, from the drag-and-flick physics to the way missions are cleared. 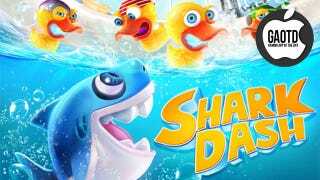 Those few things Shark Dash does of its own accord are welcome; once you knock them in the water, the ducks you're trying to eat will float right into your mouth, and there are tricks like accelerator gates that add a layer of complexity to puzzles. First released earlier last year, Shark Dash is now free to download, but you can pay for better sharks and power-ups.